"Do you fancy painting a specific set of the weird spacemen that we have been drooling over for quarter of a century?" Cheetor said to Curis and myself. "As a group paint along?" But which weird spacemen? 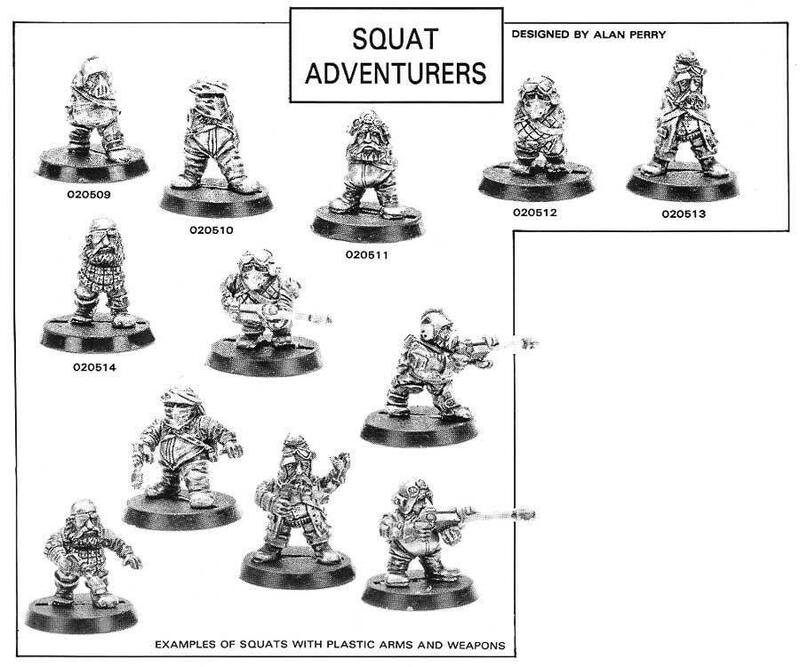 Why the late 1980s Citadel Rogue Trader Adventurers range of course. 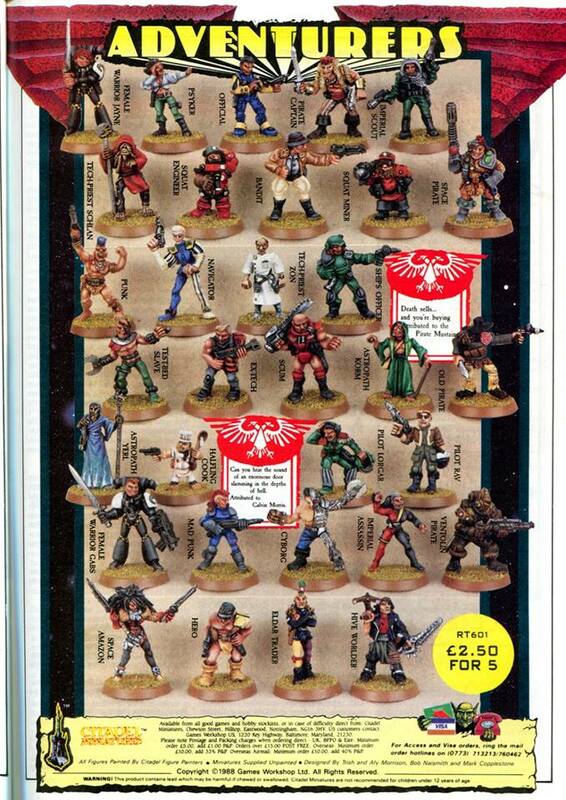 The iconic full-colour advert for the RT Adventurers range. As with all paint along projects I've participated in, cheetor, Curis and myself are aiming for a mutually supportive approach which will result in actual figures being painted. Actual figures that for some cases have been on our wish lists or in our collections for literally decades. Q. How will the process work? A. 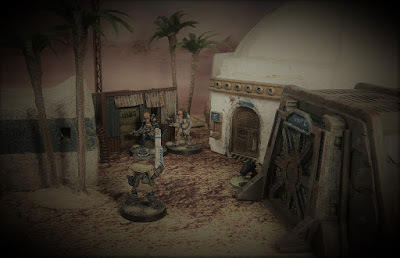 We take it in turns to paint up an Adventurer, tagging the next in painter in a circular chain until we either paint up every single Adventurer model ever, or we get bored and decided to do something else. Q. What figures are 'valid'? 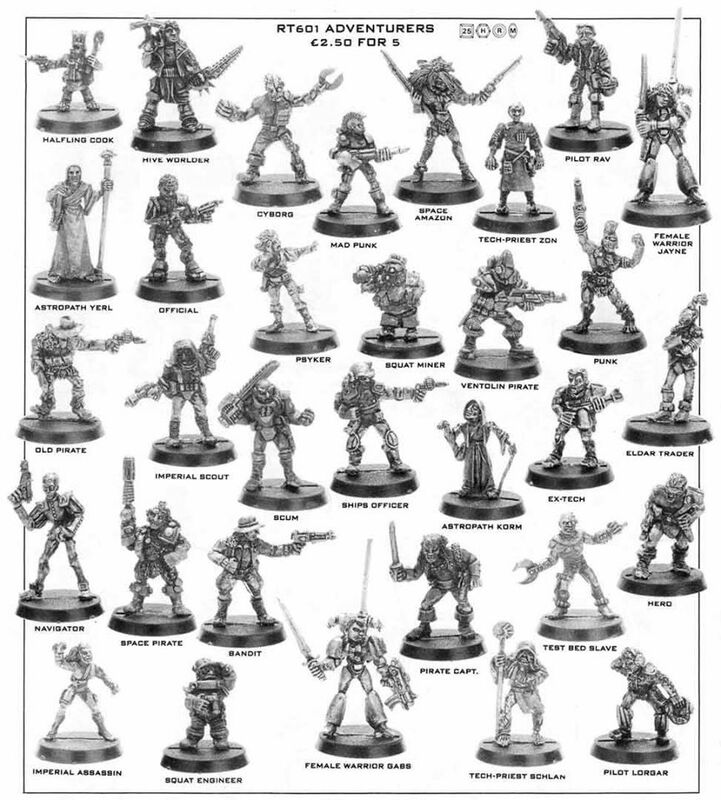 You have to admit that's a pretty iconic selection - some of the most characterful figures ever produced by Citadel, including some of my absolute favourites. The hardest part to this project has been where to start and working out which models to select. 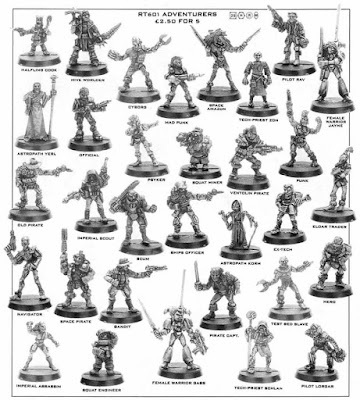 I approached it from the perspective of trying to make a coherent group, and where better for my first selection of figures, than an Imperial Inquisitor and his retinue. 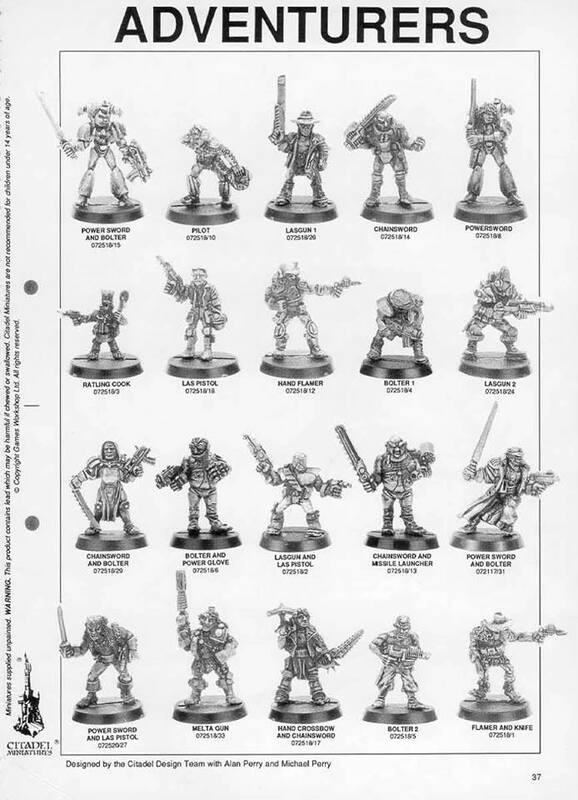 Happily, our list of approved figures included a necessary Inquisitor model, masquerading under the catalogue title of 'Lasgun 1'. But who is this enigmatic character? 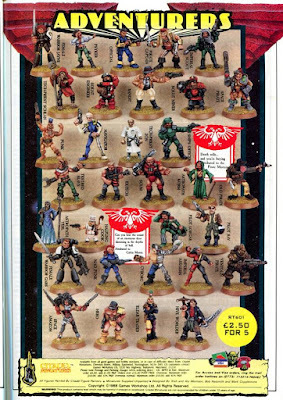 We simply need to look at the pages of Rogue Trader to find out. 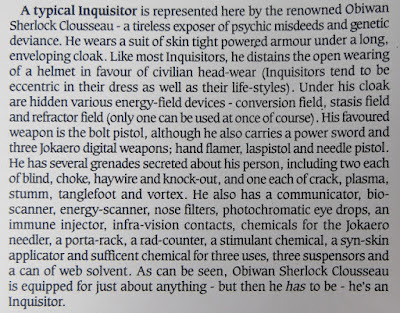 He is none other than Inquisitor Obiwan Sherlock Clousseau. 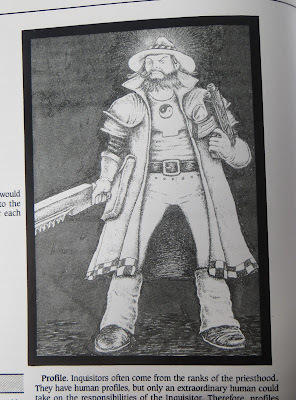 Rogue Trader illustration by Martin McKenna. Rogue Trooper Major Magnum. Image from CCM Wiki. The resulting figure oozes character with a strong Western vibe. 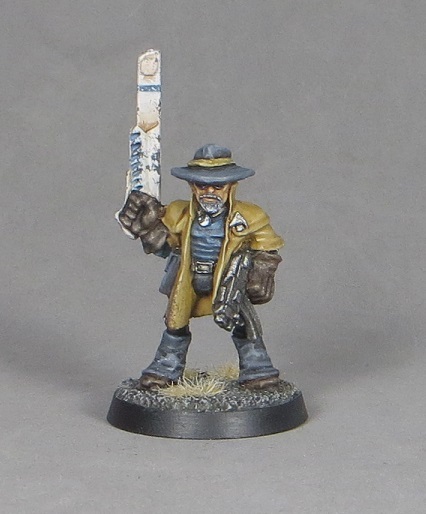 He's the lawman taking down grox rustlers. He's the lone gunman coming to the aid of isolated promethium miners. He's the defender of townships against the warpaint-daubed Kroot. He's the voice of the Imperium in the wild fringes of settled space. Similarly I added a some cheques to the trim of his coat, again the reflect the illustration. The sculpt seems a little older and more grizzled than the wild-bearded illustration, so I gave him a greying beard and slightly sallow skin tone. 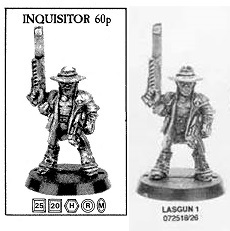 As for his, um, 'lasgun' - I'm not entirely sure what it's supposed to be. A shotgun perhaps? Or some kind of advanced close combat weapon? On cheetor's suggestion I painted it up as a Tau-esque pulse weapon (which seems fitting for an Inquisitor, who I suspect is from the Ordo Xenos). On that note, the sculpting on the figure leaves a lot to be desired. There are lots of details which are unclear, poorly executed or blend into each other. I'd go so far to say that this sculpt is more crudely executed than pretty much any other Rogue Trader figure I've painted...and that says something! 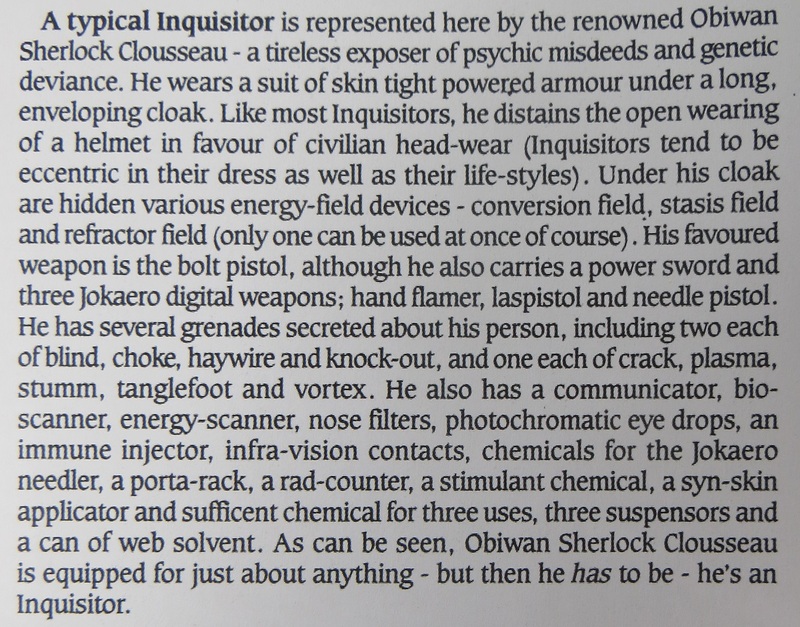 But for all his faults, Inquisitor Clousseau is a prime example of character being distilled into a figure. Does it matter that he's carrying a stupid block of a weapon? 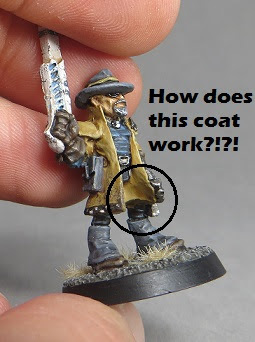 Does it matter that his left leg must go through a hole in his coat lining? 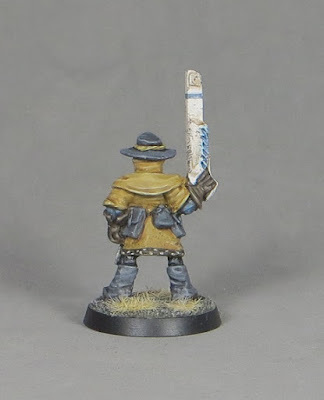 Not really, because the resulting figure just oozes John Wayne or Clint Eastwood. That's the best kind of Inquisitor. But I do quite like the flamboyant dress-wearing kind too! Great image but definitely more Clint than Marion with that beard. I just finished painting up that Magnum bloke actually. 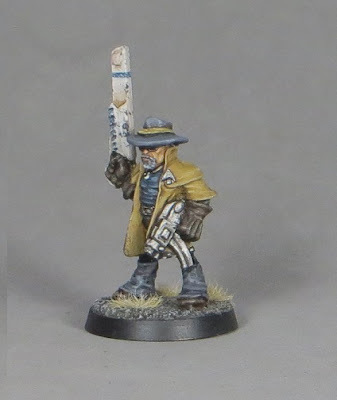 Never knew he had been re-purposed in the role of this here esteemed Inquisitor. 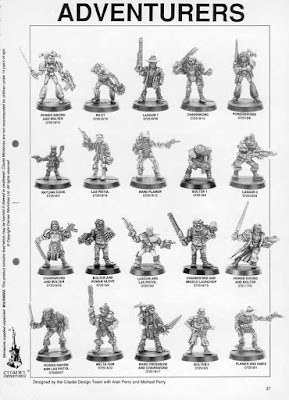 But then again, GW were masters at squeezing the most life out of their sculpts weren't they. I've warmed to his weapon, but I know of several folks who disliked it enough to replace it! Looks more of an angry Space-Western Sheep Farmer to me, doing his best to fend off the violent advances of the Bovine herders on some Star-baked scrublands alien planet. Per usual mate, fantastic work and a really fun project. I'll take angry Space Sheep Farmer. Perhaps that's the undercover persona?! Thanks! A great start on the project Jon, well done. I replaced the gun on my copy with a shotgun back in the 90s. I wanted to play up the "Git offa mah land!" hover rocking chair on the porch vibe. It's a dodgy sculpt, but the little guy has presence. I'm saying he already has a shotgun. A space shotgun to go with the hover rocking chair! 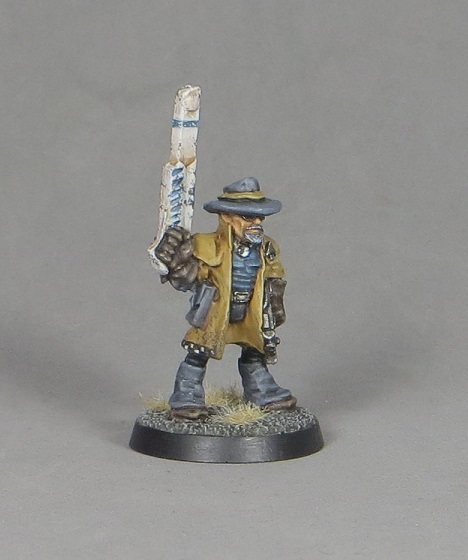 I've got him undercoated and ready to go for Clousseau's retinue as it happens. Nothing to stop you painting him up yourself though - I'm always interested to see how people approach such a distinctive figure. Nice job mate, I love the face, he's a great little character - even if his coat is a bit iffy! Colours are perfect! The tan overcoat screams western while the muted blues anchor the character in a scifi context. 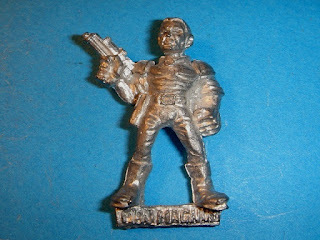 I am super impressed that you knew this was based on an earlier Rogue Trooper figure. Do you own that figure too? He looks great, especially considering the state of the original sculpt. Walter White! There is absolutely! I hadn't noticed, but it's there. Apart from the fact that Walter would be shaking and cowardly!